George Cappony is the nation’s foremost real-estate mentor for investors looking to sell homes quick…and without the expense of using a broker or real-estate agent. He has worked one-on-one with homeowners and investors for the past 11 years; as well as spoken to investor groups across the country. He has coached over a thousand homeowners and investors, from coast-to-coast with this best-bidder home selling system to teach how to sell your home fast. George’s no-risk sale-by-owner system is based on the best-selling book How to Sell Your Home in 5 Days, by Bill Effros. Effros hand-selected George as the national guru for this method 11 years ago. George has cultivated this method beyond the basic teachings of the book into a truly tried-and-true system. Learn exactly how to sell your home fast with this amazing method. George’s method is based on your needs to sell homes quick and effectively, without the pressure of spending weeks or months on the market. He provides a safety net of guidelines for investors and homeowners selling their investment properties to follow. George knows exactly how to attract potential buyers that not only will bid on your home, but drive the price right to top fair market value. His presentation is informative as well as entertaining. A 90-minute multimedia, hard-hitting presentation accompanies his speaking during investor coaching sessions, in which George truly breaks down step-by-step how to sell your home quick. The perfect starting bid guaranteed to create a frenzy of buyers. The recipe for an attention-grabbing classified ad. The right signage and locations to direct the maximum number of potential buyers to your sale. How to properly prepare the home for inspection. What information and reports buyers need to make a serious bid. How to efficiently run a 2-day sell home quick Open House. The key players necessary to close the sale. George has been featured on a large assortment of nationally-recognized media outlets for his consultancy package and this revolutionary 5 Day Sale Method. These outlets include: CNN, The New York Times, Fox News, The LA Times, The Boston Globe, Wall Street Journal This Morning, CNBC — as well as a large number of local newspapers and television interviews. He has also been recently featured on Cash Flows Member’s Audio – a CD interview created to answer those pressing questions investors may have for George about his sell home quick method. 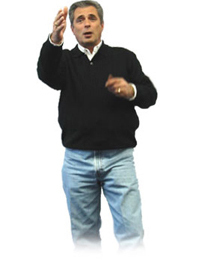 His empowering coaching truly puts you, the investor, in charge of the sale. His 11 years experience has enabled him to perfect an already successful method, allowing thousands of sales-by-owners to take place across America. He knows exactly how to draw in the right buyers for your home, and create a best-bidder frenzy that only drives the sale price right to the top of the market!